The Bank of England used to trade in this building for 87 years, until 1975 when the premises were sold to a building society. In 1994, Fuller’s Brewery took over the lease and began major refurbishment with the aim of restoring the building to its former glory. Re-designed in Italianate style, the beautifully renovated Grade I listed building offers stunning surrounds with an extremely opulent interior, standing out as one of the finest pubs in Central London. They did a fantastic job and the lavish interior is simply impeccable. Complete with luxurious marble, grand paintings and specially commissioned murals illustrating the worlds of finance and law with a strong Victorian and Edwardian character. Meanwhile, large columns rise up to the high ornate, sculptured plaster ceiling where there are three impressive brass chandeliers. The centrepiece is the imposing bar that stands so tall that a ladder is provided to reach the top shelves. There is also a gallery seating area along one side of the pub that allows you to get a great view of the room and see some of the features in greater detail. City of London pubs aren’t generally known for their outdoor space, so the courtyard makes the Old Bank of England the ideal spot for a quick after-work drink on a summer’s evening, and there is also a useful covered smoking area too. The Old Bank of England Pub has a somewhat gruesome connection with the past, as it is between the site of Sweeney Todd’s barber shop and his mistress, Mrs Lovett’s pie shop. The tunnels and vaults below the present building were where Todd’s victims were butchered before being cooked and sold in the pies to Mrs Lovett’s unsuspecting customers. The Old Bank of England is famous for their pies too. For all the right reasons, however. They pride themselves on the delicious homemade pies. Fresh pastry crammed with the finest ingredients and quality British meat, from chunky steak and ale to roasted red peppers in Stilton and paprika cream sauce. Wonderfully filling and perfect for lunch in the city, whether it is a break from work or a recovery from sight-seeing. The Old Bank of England Pub serves food all day including a good choice of starters and puddings, quality pub grub, as well as afternoon tea including sandwiches, light bites and sharing platters are also available. The full range of Fuller’s beer is available such as London Pride, ESB, Chiswick Bitter, Honey Dew and London Porter. 1845, Golden Pride and Vintage Ale are also available in bottles. Among the spirits is the highly rated Sipsmith from Hammersmith. A particular selling point, however, is the 23-strong whiskies range. Among the malts is the unique vatted blend, Sheep Dip and a stonkingly strong 60% abv Glenfarclas from Speyside. There are also twenty-four wines to choose from, by the glass and by the bottle. Looking for a function room in the City of London area for a party, meeting or wedding reception? Choose your favourite between the beautiful Gallery, Club or Dining Room. 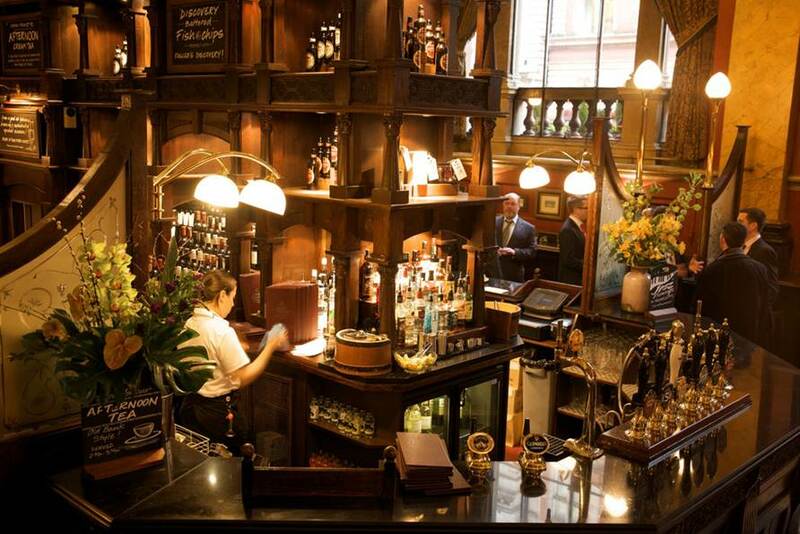 This is a very popular, deceivingly large pub, and it’s clear to see why. If you want a specific table for lunch, it’s best to book, especially on a Friday as it often gets very busy. 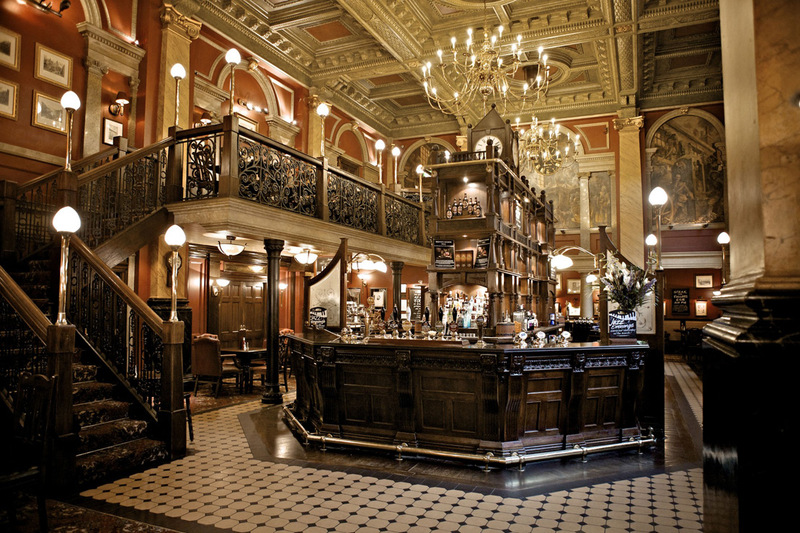 No pub in London encapsulates Victorian power and prestige like the Old Bank of England in Fleet Street. Designed by eminent architect Sir Arthur Bromfield, it has past attachments to the worlds of finance and the law. However, if you’re not interested in the architecture or the history, you’ll still want to witness the eye-catching, jaw-dropping surroundings, not forgetting trying out the real ales, unusual whiskies and well-cooked pies! ← Previous Previous post: How to write a curriculum vitae: what you should never include! Next → Next post: What is a buyer’s, seller’s and neutral market and how is it like in the UK?